They're baa-aack... 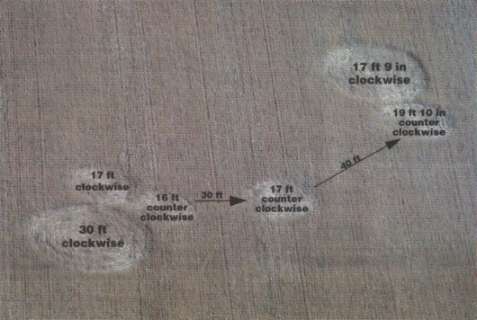 Following closely on the heels of crop circles that appeared in the Vanderhoof area in 1998, these six circles were spotted in a field of grain about five kilometres down Sturgeon Point Road. For the second time, pilot Brent Miskuski has seen something strange as he flew over Vanderhoof. On his way home to Prince George at about 7:30 last Thursday evening, Miskuski took off from the Vanderhoof airport over Sturgeon Point Road. Pressed into the grain crop were six circles known as "Crop Circles". "I didn't have my camera, so I went back out (Friday) morning and took some pictures," be said. "I don't know if anyone knows they're there. I didn't see any tracks of footprints going in there." "Last time, Eric (Spier) and I were the first to see those, too," said Miskuski. "There are fewer now and they're smaller." Spier, the pilot who spotted them first in 1998 agreed. "I don't think these ones are as nice as the first ones," he said. "They look rougher." Rough or not, the circles are already grabbing attention. Crop circle specialists from Vancouver, UFO enthusiasts and documentary makers are already on their way to the small town. Brian Vike, an Unidentified Flying Object researcher from Houston was out Saturday morning, collecting soil and grain samples from the new circles. "This is my first time looking at circles like this," he said. "It's really exciting." Vike, who describes himself as an "open minded skeptic"; usually gathers reports of UFO Sightings in the area. He spent Saturday collecting as much data about the six circles as he could. One formation of circles now being referred to as "Mickey Mouse's head" consists of three separate circles. The largest one is 30 feet across and is flattened in a clockwise spiral. The smaller two are 16 and 17 feet across the smaller one flattened in a counter clockwise spiral and the other clockwise. About 30 feet away lies another 17-foot circle in a counterclockwise pattern. Forty feet from that is a formation of two circles one is 27' 9" across in a clockwise spiral and the other 19' 10" in a counterclockwise spiral. "Nobody had touched it before I got out there," said Vike. "There is one set of tracks out to one of the circles, but absolutely none leading from circle to circle and no other disturbances to the grain at all." "The stalks of grain in the circles are all intact, simply bent over," said Vike. "Nothings broken, just flattened," be said. "The spirals go in tighter and tighter as you approach the centre of the circle and they start to overlap a bit in the middle." Vike also Interviewed several people in the area who reported a "smoky" smell on the night the circles were first seen. "One lady said the smell was so disgusting they had to get up and close the window," he said. Vike's UFO research has kept him hopping lately. He said Sightings are up almost 55 percent this year alone He's never encountered crop circles before, however. "I hate to say it, but I suppose it would be fairly easy to fake them. That's why we take all these samples for analysis," he said. The samples will be tested for "just about everything", including magnetic traces, chemicals, and molecular structure. "Man made or not," said Vike, "they're still cool."